Bike challenges abound for a reason: There’s something about matching yourself against other riders or the clock or the calendar that gets people rolling. If you’ve been logging your miles in the National Bike Challenge that just wrapped up yesterday and are already missing that extra inspiration, have no fear — coffeeneuring is here just in time! The brain child of Joe Platzner (@thatsrando on Twitter), a former board member of both Washington Bikes and Cascade Bicycle Club and a Seattle International Randonneurs member, coffeeneuring provides a caffeinated excuse for leisurely bike rides. Seven coffee shops in seven weekends — nothing to it, right? That’s why this is the challenge for everyone. 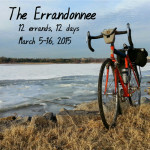 A randonneuring bike blogger from the other Washington, Mary Gersemalina at Chasing Mailboxes, put together the rules and launched the Coffeeneuring Challenge in 2011. Now in its fourth year, it seems tailormade for the bike-riding coffee lovers (coffee-drinking bike lovers?) of our Washington. I’m going #coffeeneuring & you should too. The cards, developed by Cascade Bicycle Club and sporting our logo and theirs, provide a brief message illustrating why bikes mean business and help inspire business owners to be bike-friendly. If you don’t want to wait for the mail and you’re in the Seattle area, stop by our Pioneer Square bike gift shop/offices at 314 1st Ave. South, sign up for our e-news, and we’ll give them to you on the spot. Mary’s offering a coffeeneuring patch at her cost ($4) to those who successfully complete the challenge; request those directly from her following the instructions below (also on her 2014 Coffeeneuring Challenge post). You may also coffeeneur to a Coffee Shop Without Walls. 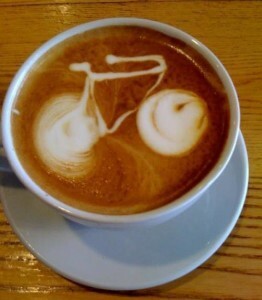 A Coffee Shop Without Walls is a place you ride to where you then proceed to make and/or drink coffee. The Coffee Shop Without Walls is geared toward the bike overnight or bike camping participant. It also captures farmers’ markets, festivals, and the like. Only Saturday and Sunday rides qualify. Weekday rides are ineligible, unless one of the following applies to you: a. You have a job that does not have a Monday through Friday tour of duty. In that case, your days off are considered your weekend; or b. You are retired, in which case you may choose any two days to complete your coffeeneuring outings. No other exceptions, unless you can make a convincing case for one to Mary. WA Bikes note: Don’t wait until the end to share pictures with us — tag with #WAbikes #coffeeneuring on Instagram. WA Bikes note: Note that this rule does not prevent you from organizing a coffeeneuring ride. 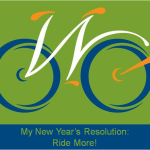 If you do, add it to our Washington state bike events calendar and drop a note here and on our Facebook page to invite others. 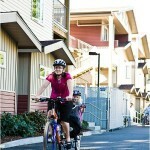 WA Bikes note: Setting off on a fall bike tour inspired by Cycling Sojourner Washington? Remember to check out the Coupon Companion for coffee shop deals, including stops like Cinnamon Twisp Bakery or Caffe La Boheme on Lopez Island. Send submissions to Mary: gersemalina-at-gmail.com. They may be in the form of links to blog writeups, screenshots of or links to your coffeeneuring Tweets, on-line photo galleries with accompanying narrative, Word documents with attached or embedded photos, or e-mail writeups and submissions with photos attached. Provide all qualifying rides at the same time. That is, send all 7 together, NOT ride 1, ride 2, etc. WA Bikes note: Send it our way to Louise-at-WAbikes.org. Don’t wait until the end to send it to us. Write a post on your first weekend or your halfway point or some other memorable point and we’ll share some posts along the way to inspire others. We’d love to have a map, too, if you’ve put together a nice route someone else might enjoy. Prizes! You are eligible for a small prize from Chasing Mailboxes for finishing the challenge. Because of the increased interest in coffeeneuring, the premium will cost $4, which covers Mary’s costs. To purchase your prize, you may PayPal her at the gmail address above, or send your money by snail mail like Grandma used to do. Email Mary for her address. WA Bikes note: Everyone who submits a blog post or Instagram picture to us will be entered into our prize drawing to win one of several oh-so-appropriate WA Bikes coffee mugs. Tara Rule: During Columbus Day weekend (October 11-13), you have three days to accomplish two qualifying coffeeneuring rides. (This is the Tara Rule.) Update! Residents of Canada may use Canadian Thanksgiving in place of Columbus Day. Veterans Day Rule: You may coffeeneur on November 11, Veterans Day, INSTEAD of the previous Saturday or Sunday (November 8 and 9). Veterans are permitted to coffeeneur on November 11 in ADDITION to November 8 and 9, in recognition of their service. Cards with statistics about the value of biking customers that you can leave at businesses you patronize by bike are available from Cascade Bicycle Club or WA Bikes. Spread the word: Bikes mean business! #Coffeeneuring=great excuse for a bike ride. Join us. Blogging: Mary will do periodic roundups of blog posts about coffeeneuring at Chasing Mailboxes. We’ll do that for Washington bike blogs here so send us your link via email, Twitter, or a comment here. If you own a great destination for the coffeeneuring crowd and want to invite biking customers to your front door, sign up on the form below and tell us why you’re a great bike destination, along with any special offer you want us to highlight. We’ll include you in our social media and e-mails to people who sign up for the challenge so they can go hunt down your two-wheel deal. This article was posted in Bike Culture, Encouragement, Events, News. Bookmark the permalink. Follow comments with the RSS feed for this post. Both comments and trackbacks are closed.